If you’re looking to open an outstanding interest bearing account, you’re looking at the right direction. 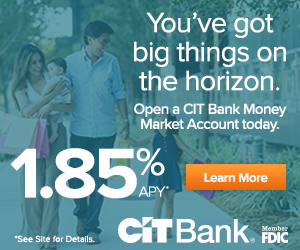 Available nationwide, CIT Bank is offering you a 1.85% APY on your funds for opening a new CIT Bank Money Market Account. With a CIT Bank Money Market Account, you can earn a competitive interest rate and access your money easily. It’s an ideal online account for building an emergency fund or saving for a large purchase. Save smart and get more for your money today! This account is one of the nation’s top rates—over 16x the national average. Higher rates than traditional banks. 24/7 Account Access. Secure banking features. FDIC insured. All it takes is a minimum opening deposit of $100 to open and earn daily compounding interest to maximize your earning potential – PLUS your funds are FDIC insured. Below is all the information you need to earn 1.85% APY Rate on your funds when you open a new CIT Bank Money Market Account. In addition to the current rate from CIT Bank, you can also take advantage of a range of great promotions from banks such as HSBC Bank, Chase Bank, Huntington Bank, Discover Bank, TD Bank, BBVA Compass Bank or CIT Bank. To apply, you can click the link above or the “Apply Now” button throughout the post. Each will direct you to the promotion in which where you can apply for this outstanding savings account! Here is your opportunity to earn a an interest rate of 1.85% APY on your funds. 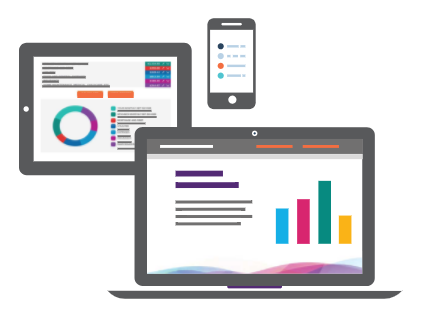 Open a new account and get started today! CIT Bank Money Market Account: Open your account today and start earning interest on your funds! To apply, you can click the link above or the “Apply Now” button throughout the post. Each will direct you to the promotion in which where you can apply for this outstanding interest bearing account! If you are interested in what more CIT Bank has to offer, see our compiled list of CIT Bank Promotions. How do you open your CIT Bank Money Market Account? It’s simple! To ensure the safety and security of your funds, CIT Bank will make two “test” micro deposits to your designated funding account. The funding account must be a bank checking or savings account. CIT will then offset those micro deposits with a single withdrawal. Within three business days, you will receive an email with instructions on how to verify the deposit amounts made to your funding account. Once you have completed this step, CIT will let you know by email that your new account has been activated. PLEASE NOTE: As soon as you verify the “test” micro deposits, we will immediately process the transaction to fund your new account. With the CIT Bank Money Market Account, you will not have to worry about any monthly fees. Get maximum returns with no fees to open or maintain the account. The CIT Bank Money Market Account is a liquid savings account that pays a variable rate of interest and allows deposits, tranfers and withdrawls with a limit of six such transactions per monthly statement cycle which is governed by Federal Regulation D. The minimum to open an account is $100. How can I access my money and make payments with a CIT Bank Money Market Account? You can access your funds and make payments using People Pay. What is People Pay and how does it work? People Pay is a free service that allows you to send money from your Money Market account to almost anywhere with an email address or mobile phone number. On the go. In the know. CIT Bank Mobile Banking helps keep your busy life and finances moving ahead. There’s no stopping you with these free services that help you manage your money anytime, anywhere. Download the CIT Bank App today via iOS or Android. If you’re enrolling for the first time: Sign in to your account online and click “Get started” under the Mobile Banking tool on your My CIT Bank dashboard. Follow the instructions to enroll your mobile device in both Mobile and Text Banking. If you’re already a Text Banking user: Our new Online Banking system will become operational on Monday, June 6. As a result, you’ll need to re-enroll in Text Banking. Sign in to your account online. Then follow the instruction above. What is the bank’s routing number? The bank’s routing number is 124084834. *If you are a CIT Bank’s commercial, listing service, or institutional client, please call us at 877-748-0004 for the routing number to use for wire instructions. All your banking, in your pocket or purse. Download the CIT Bank App today via iOS or Android. If you do not have a supported Apple or Android device, you can access these features at m.bankoncit.com. Reach someone helpful 24/7. Call 855-462-2652! You can also find answers to the Frequently Asked Questions (FAQs). Turn your everyday savings into so much more. A CIT Bank Money Market Account helps you get more from your savings with interest rates for maximum growth, so if you’re looking for a phenomenal interest bearing account, definitely consider this one. Far better rate compared to your brick and mortar banks/credit unions. See how CIT can help you reach your goals. Let us know about your thoughts and experience with this account! Be sure to check back on BankDealGuy for more bank promotions and/or for more bank rates!